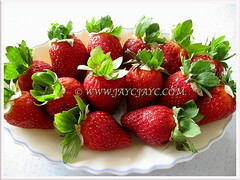 Garden Strawberry with its characteristic fragrant aroma, delightful sweet flavour, juicy texture and brilliant red colour make it simply irresistible to many people. 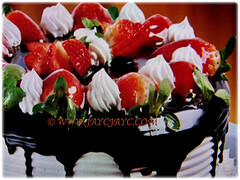 Strawberry is popularly cultivated worldwide for its delicious fruits that can be eaten fresh or used in pies, ice-creams, milkshakes and cakes, to name a few. Botanical Name: Fragaria x ananassa (a complex hybrid species that’s a cross between Fragaria chiloensis, the Chilean strawberry and Fragaria virginiana, the Virginian strawberry. 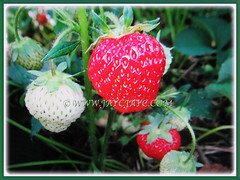 Common Names: Strawberry, Garden Strawberry, Cultivated Strawberry. 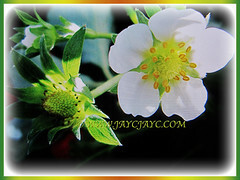 Etymology: The genus Fragaria means fragrance and refers to its fruits. The specific epithet ananassa is Latin for ananas-like. The common name Strawberry is possibly derived from strewn berry in reference to its strawberries being strewn across the ground with their runners straying everywhere. Origin: Not applicable as it is a hybrid species. It is widely cultivated around the world, especially in subtropical and temperate regions. Plant type: An ornamental and perennial fruit-bearing plant. 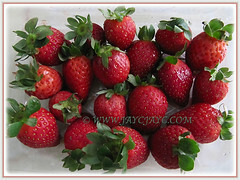 Features: Fragaria x ananassa is from the genus Fragaria that comprises of more than 20 different species. It is a low-growing herbaceous perennial with short stems and grows up to about 10-20 m high and will spread to about 50-100 cm. It produces a basal rosette of evergreen and three-palmate leaves with 3 toothed leaflets, green to dark green in colour. Flowers are usually white but sometimes pink and 5-petalled, measuring about 2-2.5 cm across and with a yellow conical receptacle. They are usually produced over an extended period. The bisexual flowers are solitary and located axillary. Flowers are followed by delicious red fruits which have their seeds on the outside. From the botanical point of view, the fruit is not a true berry. The red fleshy and edible part is an aggregate accessory fruit with many achenes and receptacle tissue. Later in the season, the plants send out stolons or runners which spreads out and form new plants at the tip. Cut them off to propagate as new plants and leave the parent growing. 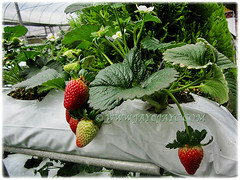 Culture (Care): Fragaria x ananassa or Garden Strawberry can be grown easily with least maintenance. Light: Full sun all day for best fruit production. Others:At the end of fruiting season, trim off old yellow leaves and clean up any mouldy fruit still attached. Mulch to help suppress weeds and reduce evaporation from the soil. 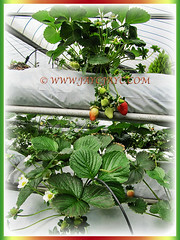 Protect your plants with some sort of netting to prevent birds from attacking the vibrant red fruits. Once monthly, feed the plant with a balanced liquid fertiliser to stimulate growth and fruit production. Generally free from serious pests and diseases. 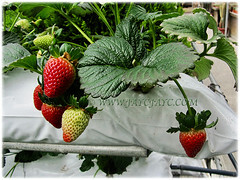 Fragaria x ananassa or Garden Strawberry prefers temperate climate. Best to plant it at soil temperatures about 10°C. Most cultivars grow well under cool climatic conditions. However, temperatures below -0.5°C can cause severe damage to full blooms. To overwinter in cold climate locations, the plants should be covered with hay mulch before permanent snow buries them. It is not well-suited to the tropical and humid weather. Nonetheless, it has been grown successfully indoors without air-conditioning near a sunny window. Plants are self-pollinating but they can be hand-pollinated with a paintbrush for optimal results. Plants can be harvested in approximately 11 weeks from initial planting. Propagation: Easily propagated vegetatively from stolon or runner. 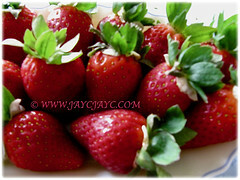 Usage: Fragaria x ananassa or Garden Strawberry is widely grown for its vibrant red, fleshy, aromatic and sweet fruit. Moreover, they can be consumed in large quantities, either fresh or in such prepared foods as preserves, fruit juice, jams, pies, ice-creams, milkshakes, chocolates and cakes. 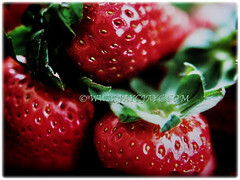 Artificial strawberry flavorings and aromas are also widely used in many products such as lip gloss, candy, hand sanitizers, perfume, and many others. It is suited to be planted in flowerbed, border or in pots. Ideal as groundcovers too. Excellent as an indoor plant, especially in tropical, hot and humid regions of the world.